Arm and hand nonverbal "gestures"- when used contextually and proportionately are powerful communicators. With respect to body language behavior nomenclature, gestures belong to the category of either "MAPs" (Manipulators, Adaptors, Pacifiers) or "Illustrators". We can either build rapport with these nonverbal signals - yet just as often, without realizing, we will destroy it. MAPs and Illustrators may project qualities such as arrogance, humility, compassion, dominance (or hyper-dominance), alpha behavior, beta behavior (or alpha-beta hybrids), confidence, acquiescence, deception, etc. Many people use gestures in incongruently with respect to their vocal qualities (paralanguage) and their verbal language - and in so doing, they "leak" their true thought-feelings. Sincerity is present (and we recognize it) when - in contrast, people use all three modes of communication (verbal, nonverbal, paralanguage) congruently. 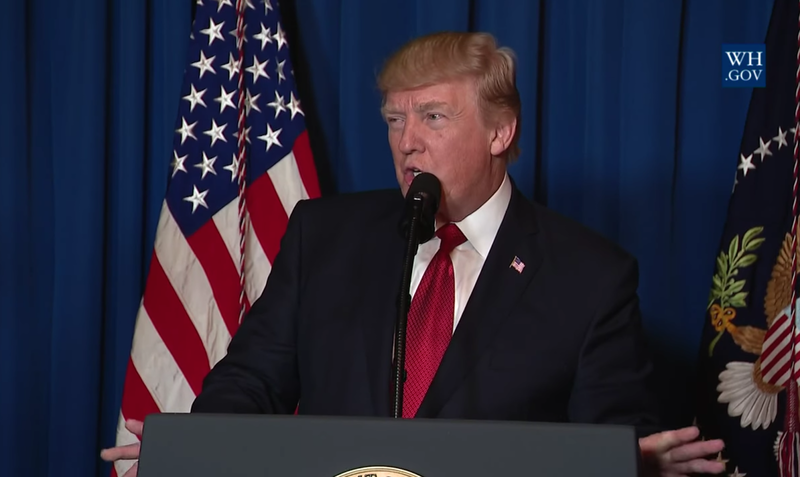 Last night, during his statement regarding the US retaliation in Syria for Bashar al-Assad's recent chemical gas attacks, Donald Trump displayed almost no hand gestures. Although he did use some shoulder illustrators, there were NO arm gestures and only very brief finger extensions during 1:04 (as he says, "... It is in this vital, nation security interest of the United States ...") - and during 1:59 - 2:02 and 2:02 - 2:04 ("Tonight I call on all civilized nations [fingers briefly back to lectern] to join us in seeking to end this slaughter ...") - with the remainder of each hand staying anchored on this lectern/podium. This near abstaining of arm and hand usage is very rare for President Trump. During a speech or statement regarding recent tragedy, loss of life - and/or that of a military attack - particularly as events are in the early stages - hand and arm movements which are held lower on the body and are minimal (as we see exampled here) - send messages of greater respect and reverence for the lives lost and somber nature of the events. If President Trump had used hand and arm movements which, for him, are typical (flamboyant, hyper-alpha, dominant, etc.) - this would have been dramatically out of context here and it would have been "felt" by many to be self-serving. Even moderate arm and hand gestures would have seemed "tone-deaf" and insensitive. Nonverbal Communication Analysis No. 3899: President Trump regarding Poison Gas Attack in Syria - What Will Trump Do? Nonverbal Communication Analysis No. 3843: 84 Lumber Super Bowl Ad - "The Entire Journey"